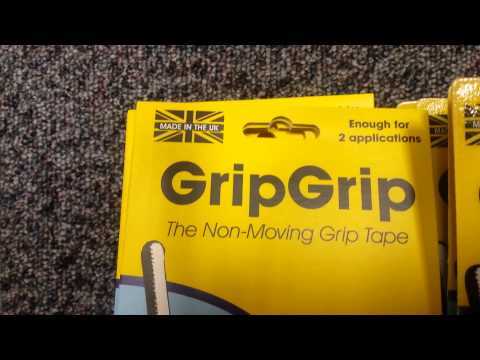 Buy GripGrip Non-Moving Grip Tape Strips,stops your grip moving. 4 x Strips of 10cm x 19mm - enough for 2 cricket bat applications. Hold for 30 seconds and roll your grip back down to apply. Once applied, the tape stops your grip moving. Does your bat grip always move? Look no further! An evolution of GripGrip Non-Moving Grip Tape, which burst onto the scene in 2014, the new GripGrip Non-Moving Grip Tape Strips are the solution to the universal cricket problem of the slipping bat grip! With four strips of 10cm x 19mm tape included, the GripGrip Non-Moving Grip Tape Strips are a lower cost option of GripGrip and enough for 2 cricket bat applications. In just a couple of minutes, a quick and easy application of GripGrip Non-Moving Grip Tape Strips stops your grip moving without any impact on the feel of the bat handle.